One hundred years ago today, our father among the saints, Raphael of Brooklyn, fell asleep in the Lord. After several days of suffering without complaint, this missionary and bishop in the American Church rested in peace. And in his life, he left an example to those who wish to lead godly lives. This pious man, whose parents were cared for and ministered to by the holy martyr Joseph of Damascus, was still within his mother’s womb when they fled Damascus for Beirut while extremist Muslims, with the aid of Turkish police, were murdering over 2,500 Orthodox Christian men and destroying nearly every Christian church. Despite this tragic beginning, St. Raphael grew to love the Lord and his fellow man deeply and selflessly. He was raised in Lebanon, schooled in Greece, ordained a deacon and priest in Russia, and became the first Orthodox bishop consecrated on American soil. 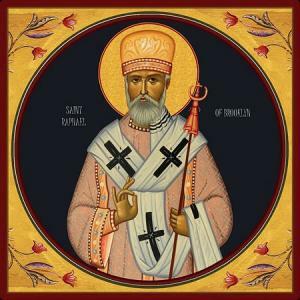 As such, St. Raphael was well prepared by God to serve the Orthodox Christians in America, most especially those of Arab descent. While he was in America, St. Raphael was offered several opportunities to minister in his homeland as a bishop. However, his heart was where he was first placed—here, in the United States. And this is the first lesson in holiness that this saint can teach us; namely, that serving others means that we must be willing to sacrifice our own ambitions—what we want and where we want to be. How often is it, however, that we would rather be somewhere else? That we would help others, but only under the conditions we have set? How often is it that we place self-serving limits on our mercy—and so limit our holiness? If we can learn anything from this holy father, let us learn to be content with where we are now, even as we strangers yearning for our heavenly home. Yet we should never crave to attain the kingdom of heaven simply for our own sake. We should also want to entice, cajole, lead and encourage as many as we can to realize this same goal. And that also is what St. Raphael can teach us. During his 20 year ministry, first as an hieromonk and later as an auxiliary bishop, St. Raphael labored tirelessly as a missionary. In the days when most travel was by bus or train, he traveled at several times across the country and into Mexico, usually stopping for no more than four days, working to gather together the Orthodox Christians in various cities. While his eyes were aimed primarily on immigrant Arabs, his heart was not motivated by building ethnic communities but rather by building the holy Church of Christ. So, at nearly every stop, he busied himself with preaching, baptizing, performing sacramental marriages and serving the Divine Liturgy. His goal was to build a community centered not on a particular language or culture, but centered around Christ and his altar. And so he was about building churches into order to build up the American Church. How often it is, though, that we see our church not as the place to gather with Christ and his saints, but instead a place to gather with friends and family? There is nothing wrong in being with friends and family in church; however, should not our greater rejoicing be that we are with the friends and family of God? And should not our goal, then, be to extend that family by inviting all we know—co-workers, neighbors and unchurched relatives—to be part of our communion by praying with us and receiving next to us the holy mysteries? St. Raphael of Brooklyn had this as his chief desire: to extend the kingdom of heaven by bringing all he could find into Christ’s holy Church. And so off he went, here and there, without concern for his own health or welfare, without complaining about weariness. Eventually, his constant travels would take its toll and wear him out. But this holy father rejoiced that his labors would result not the praise of men, but rather rejoicing in heaven with those whom he had won for Christ! Running and laboring in vain only happens when we think our holiness adds up to the number of good things we have done. But if we put away such foolish mathematical thinking, and instead focus on the well-being of others—especially the salvation of their souls—then we are truly following in the footsteps of St. Raphael and the other saints. Yet, finally, to follow in his footsteps also means to find joy in nothing other than standing before the Lord. For where else did this single man find strength? He had no family in this country to comfort or console him; no wealth to ease his way. Instead, he drew his comfort and riches and strength from his daily communing with God in prayer. As with all the saints, one cannot see the story of this holy saint unfold without seeing him always standing in prayer before the icons—whether in church or at home or on the road. Feeding on this life in God, our holy father certainly became a fruitful vine which produced, in the lives of others, great and abundant fruit. Holy Raphael, Good Shepherd and faithful Confessor, pray for us!